Not to tip my hand before the article, but when people ask me what my favorite movie is, I always say that I can’t really answer that with one movie, but that a handful is required. In that handful, always, will be GHOSTBUSTERS. It was my first favorite movie as a little kid, and it will always be on my short list. I watched GHOSTBUSTERS (1984) on 9.17.15. I’ve seen this movie, literally, hundreds of times. But this was the first time I’ve watched it since 2009, in the first year of this blog. So this is a re-ranking. We, as movie goers, will always have special places in our hearts for certain movies without knowing (or caring) if we are being objective. I’ve spent nearly seven years now quantifying every movie I watch, partly because I just want to figure out what is and what is not a good movie. That said, I’ve moved on from many of the movies of my childhood and formative teenage years. I consider the Jim Carrey comedies to be fine entertainment that aren’t particularly memorable films, save for the fact that I saw them as I learned to quote everything (with TRUMAN SHOW and, maybe, MAN ON THE MOON as exceptions). Movies I watched dozens of times, like BREAKFAST CLUB or CAN’T HARDLY WAIT or CON AIR or THE LAND BEFORE TIME are all movies I respect, but for which I see their flaws. I wasn’t that particular as a kid. Heck I watched Sylvester Stallone and Sharon Stone in THE SPECIALIST more times than I should admit. I loved the heck out of THE DISTINGUISHED GENTLEMAN. I had THE TIGGER MOVIE in my regular rotation. Born in 1982, I became a movie lover, truly, in the 90s. Many of my favorite films in any given genre come from that period of my life. I will always consider THE ROCK a premier action film, and BAD BOYS a top level action/comedy. For political thrillers, I go to THE INSIDER. For romantic comedy, I’ll always have WHEN HARRY MET SALLY at the top of my list and, weirdly, both THE STORY OF US and KEEPING THE FAITH. My favorite horror films include SCREAM and THE SILENCE OF THE LAMBS (although the 21st century additions of THE CRAZIES and CABIN IN THE WOODS are right up there). For sci-fi, I will forever lean on DARK CITY. And the best animated film of all time is still THE LION KING (with WALL-E absolutely in that conversation too). My opinions weren’t fully formed then. My love for film noir and the classics came through film classes later in college. The Hitchcock films I saw in high school, PSYCHO and VERTIGO don’t rank as my favorites of his. Guys like Christopher Nolan hadn’t really started doing their thing yet. Wes Anderson was just getting going. Back then I was in love with Neve Campbell and Katie Holmes and my current favorites, Anna Kendrick and Emma Stone, weren’t on the radar of course. I did love Tarnatino – he’s the guy who made me love film – though I don’t think he has done anything as good as RESERVOIR DOGS and PULP FICTION since he made those films (even if his less-than-his-best stuff is still better than 95% of the movies made in the 21st century). But there are certain films which just last. Objective, subjective… whatever you want to call it. When I consider my favorite films there are two movies I first saw in high school which will always be there: SHAWSHANK REDEMPTION and THE USUAL SUSPECTS. Those will always be in my top five. And there are two movies from before then, from when I was just learning about what movies were, that will always be favorites as well. First, is THE PRINCESS BRIDE (I did just name my second son Wesley, after all). Also present, is GHOSTBUSTERS. GHOSTBUSTERS taught me about comedic timing. It taught me that friends rib and tease each other even as they would go to battle together. GHOSTBUSTERS taught me how to say certain swears. GHOSTBUSTERS taught me what movies could be when they were at their best. But that is all, embarrassingly, about me. Not about the movie. 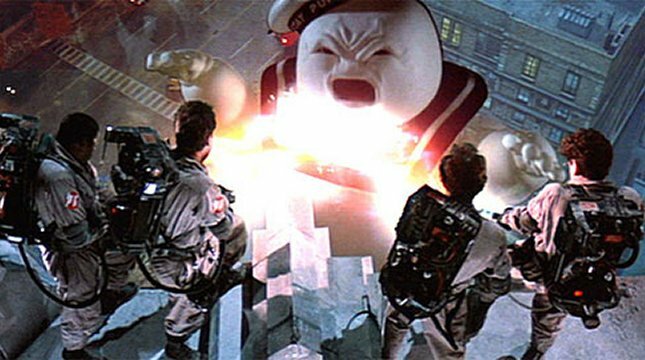 So what makes GHOSTBUSTERS so good? The story has a hack scientist, Dr. Peter Venkman (Bill Murray) having just been booted from his cushiony job at a New York university. He and his friends, Ray (Dan Aykroyd) and Egon (Harold Ramis), decide to start a business which has them hunting ghosts: The Ghostbusters. Ray and Egon are very serious about the science of such an endeavor, while Venkman is in it for the ride. Turns out, though, that the world is on the brink of seeing an undead rebirth. The epicenter of the activity is in the apartment of Dana Barrett (Sigourney Weaver). Venkman likes her (as he does most every woman he meets in the film), and his initial interest turns out to be important, as it puts the Ghostbusters in the middle of the action even as the EPA wants to shut them down, in the person of Walter Peck (William Atherton, the epitome of 80s pencil necks, in a role he would basically reprise in DIE HARD). The plot, even on multiple viewings, is actually somewhat convoluted. Part of that is because we don’t really care. We are there for a comedy, and are surprised by how deep into the ‘science’ the script by Ackroyd and Ramis goes. There is a millennium old backstory, a whole bunch of invented ghost science theory, and a great level of care in making the film’s reality clear. The number of quotable lines in this film is in the dozens, without breaking a sweat. Murray has the bulk of them, though Akroyd and Ramis get their share too. Later, when a fourth team member is added in the person of Winston (Ernie Hudson), he is given a surprising amount of weighty stuff to do. Most notably in a highway scene between Ray and Winston which delves into the mental state of each of the two men. When the mayor of the city (David Margulies) later tries to discern if the Ghostbusters are assets or not, it is Winston who provides the most convincing argument. It is a smart move by a script which sets up its heroes as goofballs and needs someone from the outside to validate that they are (perhaps accidentally) really good at what they do. There are many strong performances in here. Aykroyd and Ramis hit all the proper zany notes, with Akroyd doing just slightly more serious stuff as needed. Hudson is good. Annie Potts, as the secretary Janine, steals a couple moments. Rick Moranis is classic 80s dork as Dana’s accountant neighbor. Weaver proves she can hold her own in a comedy, a few years after proving her action chops in ALIEN. They are all really good. They all have very funny moments. But to watch Ghostbusters is to see one of the very best individual comedic performances of all time in Bill Murray’s Dr. Venkman. When we meet him, he is using science to try to get with a young coed. He looks down on Ray even as he believes in him. He is a perfect avatar for an audience feeling a little like all of this stuff we are watching is just a bit too unbelievable. He is unflappable when crazy stuff happens (except, perhaps, just after getting ‘slimed’). He is a great friend, a great ball buster, a great character. Bill Murray has had a long, great career. But he perhaps has never been better than he was in GHOSTBUSTERS. So, I love this movie unabashedly. It is an all time great comedy, a must see, a must own, and just about as much fun as you can have in 100 minutes. ~ by johnlink00 on September 21, 2015.